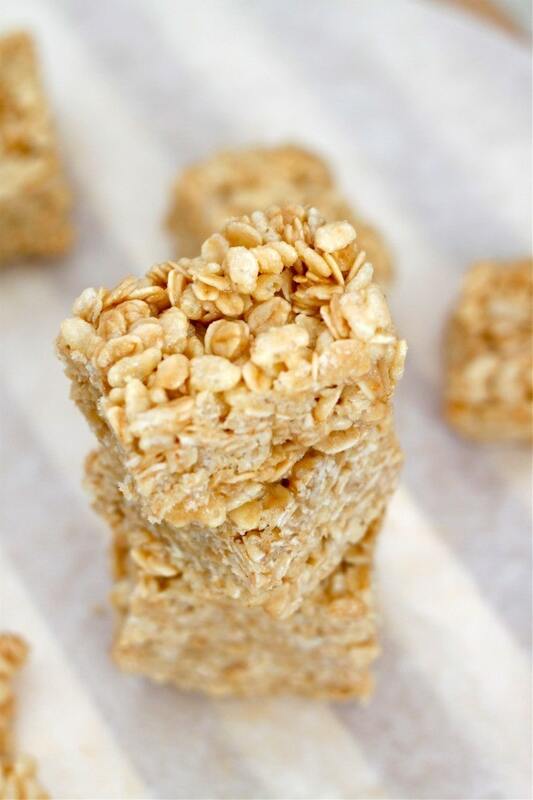 Just four healthy ingredients, 1 bowl and 10 minutes is needed to whip up these simple No Bake Rice Crispy Treats! Vegan, gluten free, refined sugar free and dairy free, it’s the perfect snack between meals! I used to think chocolate and peanut butter were the ideal combination…but I’ve been torn. Chocolate and coconut. A popular chocolate bar in Australia is the infamous bounty bar– A coconut filling with a milk or dark chocolate coating. This was my inspiration for yet another oatmeal pudding creation- similar to the Cake Batter variation– but with a tonne more coconut and chocolate and a twist on the texture…by a long shot. As with any recipe experimentation, for me personally, equals many recipe fails. The same can be said for the Bounty style oatmeal pudding. The first two times, the liquid ratio was way off, the third and fourth, it was heavy on the coconut and chocolate. the fifth, it was heavy on the coconut and chocolate. Okay, so pretty much attempt 3 was recipe success but I had to test it out at least two more times- you know, for quality control. Okay, fine. It brought back memories of eating a Bounty Bar, that it had to be made over and over again. Friends- chocolate and coconut is the new chocolate and peanut butter– the new Kim and Kanye- the new Jay Z and Solange in a cat fight- the new Mary Kate and Ashley. The bounty oatmeal pudding is so good, I’m not posting it today. Convenient, right? Well, in it’s place, I have my new favourite snack as a result of my newfound love- a Healthy No Bake Double Coconut Rice Crispy Square! Yep. Another No bake recipe. Sue me. These are made without marshmallows because I stuffed them all in these cookies. They do, however, use coconut twice and an optional chocolate layer, you can be forgiven for omitting the marshmallows. 10 minutes to prep and press into the pan- you have a winner on hand. Thank you Mary Kate and Ashley. I mean chocolate and coconut. A healthy no bake treat which has double the coconut- ready in under 10 minutes from prep to plate! Paleo chocolate, melted (can sub for any chocolate) Optional! In a microwave safe bowl, melt the coconut oil and brown rice syrup until fully combined. In a large mixing bowl, add the liquid mixture with the rice crispy cereal and mix until incorporated. If mixture is still difficult to contain, add brown rice syrup one tablespoon at a time. Prepare a 9 inch x 9 inch baking dish with baking paper and press the rice crispy mixture into it firmly. Set aside. * Sometimes, forming these can be difficult. Add more brown rice syrup 1 tablespoon at a time. Alternatively, you could also use dairy free milk of choice to help firm up. These can be kept at room temperature for up to a week (in a sealed container) or refrigerated for up to 3 weeks. I keep mine frozen and eat them semi thawed- they taste amazing this way! Chocolate and peanut butter or Chocolate and coconut? What is your favourite chocolate bar? I may have new oatmeal inspiration! Hey Jen! 🙂 You can most definitely use honey but increase the proportion by 2 tablespoons- brown rice syrup is way more sticky! 🙂 Hope you try it out! You sound like me. I love the combination of chocolate and coconut as well as chocolate and peanut butter. The other winning combination for me is chocolate and cherry. Just wait for the black forest oatmeal pudding….almost perfected. Almost. Anyone who doesn’t like a rice krispie treat can geeetttt ooout. And chocolate and coconut are indeed a match made in heaven. They look exactly like the ones I see at Starbucks!! Woah woah woah!!!!!!! Sounds like an almond joy minus the almonds!!!! I need to make these pronto! I was always a fan of Mary Kate…. Not sure why. Thanks Bridget! Hope you try it out! ………………I know what your talking about. Bad memories now. I’ll almost always go with the chocolate/PB route. It’s so addictive! Any rice crispy treat is a win in my books, though. I’ve only made them one time, but they’re so easy! These look scrumptious – brown rice syrup is a natural sweetener that I want to integrate more into my cooking. Thanks for the inspiration – pinned! Seriously, it’s one of my baking staples- mild flavour and great stick factor! Chocolate and peanut butter. Sorry I’m not sorry, but it’s not like ya didn’t see that one coming. 😉 I do quite like Mounds/Almond Joy though! I guess those are similar to bounty bars. My favorite chocolate bars are Reese’s, Butterfingers, and Baby Ruth’s. I don’t even like chocolate, but those are the ones I ninja every Halloween. YOU NEED TO TRY A BOUNTY BAR!!!!!!!!!!! Baby ruth sounds so stupid. Arman – these look and sound like squares of heaven. I want one right now with a cup of tea! Chocolate is a winning combination! I am with Lindsay – no bake e-book!! Haha, one day. 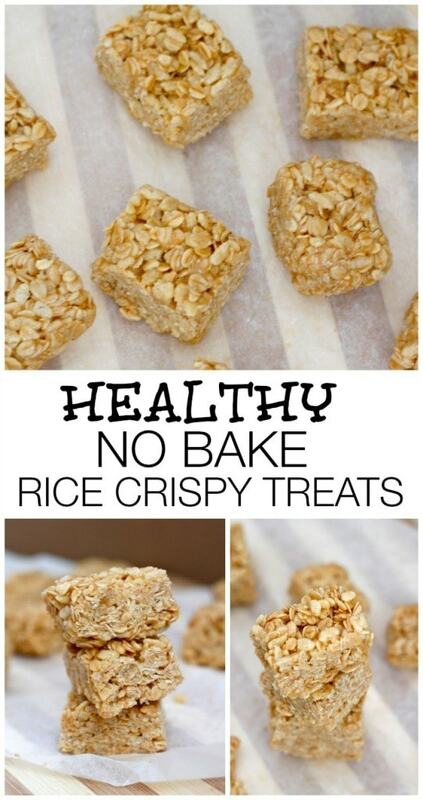 A no bake e-book! Well, seeing as I can’t do PB, chocolate and coconut win by default. But if you were to change that to chocolate and AB, then things might get a little more complicated. As for vaourite chocolate bar, that’s a no-brainer — KitKat will always and forever be the love of my life. KIT KAT PANCAKES WILL HAPPEN THIS WEEKEND. Man, that is a hard question – PB and chocolate is an all time fav but combining dark chocolate with coconut is heavenly as well! I don’t think I could choose! 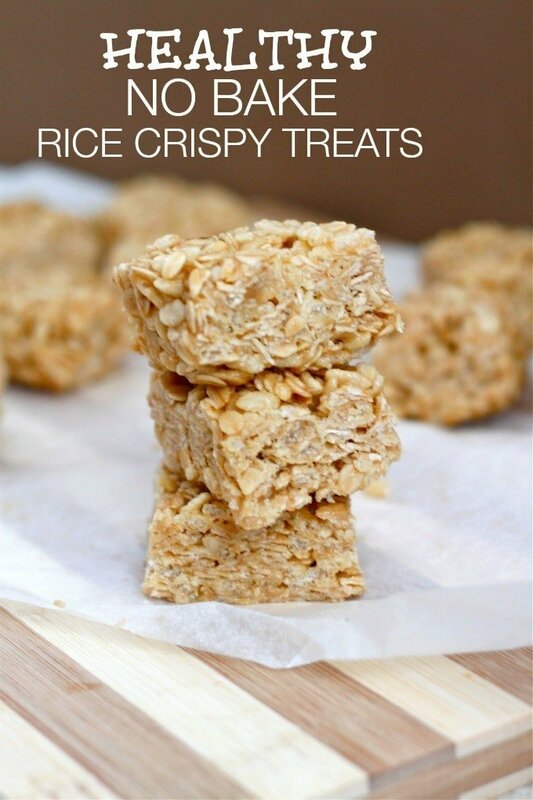 And I think I’m going to make these soon – just need to pick up some rice crispies! Go for it, P! It can be your edible Par’s Picks. My favourite chocolate bar is a Caramilk Bar or Hershey’s cookies ‘n cream. OHHHH. Hershey’s cookies and cream is so good- those crunchy chunks. Bliss. Chocolate + peanut butter FOREVER. And I think I’m an MK fan over Ashley… Also I loveee the simple ingredient list, nicely done Arman! Thanks, Cass! Seriously a good combination! Skor?! Okay, I need to google this epic creation! No question. Chocolate and peanut butter forever. Coconut is not a favorite of mine at all. Love coconut oil but actual coconut, I can do with or without…Favorite candy bar? Hmm. Tough one. I always chose peanut butter cups (shocker) but also loved Three Muskateers as well as Take 5 bars, a basic Hershey’s Bar, Nestles Crunch and really, m&m’s over an actual bar. I think I just listed an entire convenience store. I’ve never heard of half of those but nothing some googling can’t fix! Give coconut another go- promise it’s good. Oh hey, you’re talking to a former Olsen Twins fan here so… At first I thought Mary-Kate was the more awesome twin but with the whole drug and anorexia dilemma.. .not so much anymore. Actually, though, they clearly belonged together – or did I miss one of them starting a successful solo career?? – so there’s no real choice. However good these look – and yes, they do – I’m voting for you posting the Bounty oatmeal pudding next. And by next I mean… Monday 😉 ?! We’re not friends anymore. As much as I like potatoes oatmeal has priority. Chocolate and peanut butter will always have my heart…but chocolate and coconut is up there too 😉 So naturally, Reese’s are my favourite chocolate bar! As for Mary Kate & Ashley…I was never a fan. I’m a horrible example of what children should have liked in the 90s. OMG. I legit had the best idea……We should invent a pb cup but with coconut butter in the middle. Genius? Yes. What about chocolate, peanut butter AND coconut? Because I just had that. In a cup of frozen yogurt. It was divine. Love the MK & A reference – they’re the coolest. Almost as cool as you coming to LA in November… YAY!! Why not just whore all 3 of them out? Yes. Why are you so smart? Chocolate and peanut butter. I keep trying to like coconut and it isn’t working. However, I know I’m in the minority so I applaud your ingenuity. I haven’t had a candy bar in years but my favorites were Butterfinger and Snickers. I don’t know the difference between the Olsen twins. I can tell them apart but that doesn’t mean I know which name belongs to which girl. You’re coming to LA in November? Really? Snickers is so damn good- I always forget how good it is! and yep- a couple of days there hopefully and NY and Toronto! 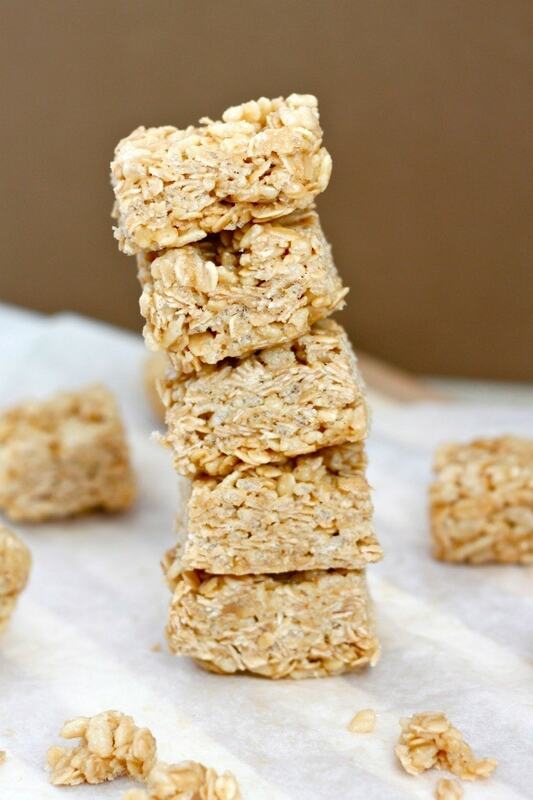 I added rice cereal to my grocery store list specifically so I could make these. Can’t wait. ….pretty sure I saw white chocolate chips too. Love it because it’s cocoa less. Oh no my friend, they are not cocoa less. The store only has the chocolate krispies so that’s why I snagged the white chocolate chips. I’m inverting your recipe!! I legit add sea salt to my chocolate baked goods- or even chocolate oatmeal. So good! I’m probably biased because I’m part islander, but chocolate+coconut will ALWAYS trump chocolate+pb or chocolate+anything else. Also, I can never make rice krispie treats properly because I end up eating half the batch before it even hits the pan. Sorry not sorry. LOL….true story – I purposely made these without marshmallows because I ate them before hand. So effing good. Kim and Kanye are so overrated… Ditto on the Olsen twins. Of course my 10 year old self would have punched me in the face for that statement. Aahh chocolate and coconut though? Worthy of honourable mention. Seriously – you are on an awesome groove huh, *fistbump* this looks brilliantly epically fantabulous. Can you tell I was heavy in love with Bounty!? Oh, Snickers! Snickers is goood..
You, my friend, are a coconut fiend, and I love it. wow rice crispy squares definitely take me back to my childhood.. these look delicious! Chocolate and PB going together like squat racks and twerking. Pingback: . link love 8/17 . - . running with spoons . No bake = always the best option. You know me, the less work, the better. I used to hate coconut because of the texture but these days I’m in loooove. Recipe sounds awesome…I will have to try. I love coconut. Look at all those awesome comments you have…you are popular Mr. Big Man’s World. =) Rock on! Haha, thanks Marsha- but half those comments are my replies so it’s a false assumption! I’m currently drinking coconut water and pretending I’m in Hawaii. These look amazing! my kids love rice crispy treats, but I always hate to feed them all that sugar. They’ll love you for this recipe. I’m always torn too, between chocolate and peanut butter, chocolate and coconut, and chocolate and MINT. Ahhhh combinations made in heaven I tell you! Thank you so much, Elise! That’s the worst thing about the traditional ones- So much sugar! What rice crisp cereal are you using that is gluten free? Every one I’ve seen contains malt. Which comes from Braley which contains gluten. Thanks for the tip! I will unmold it and add some more rice syrup. I used a very finely milled sugar free coconut so I’m sure that’s not helping things! I am confused, in the picture for these bars there is definitely oatmeal in them but not in the recipe. Am I seeing things? There is no oatmeal in it at all.